Truly Unique International Songwriting Contest Offers Unmatched Opportunities to Independent Songwriters! Our 2012 Grand Prize Winner will have a difficult decision to make…..$10,000 U.S. cash, or…. $3,000 U.S. cash and a Recording Session in Music City,USA. The winner chooses the prize! 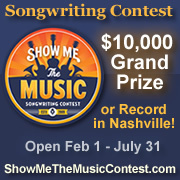 What else makes "Show Me the Music" different from all the other songwriting contests? Read on to find out! Why should songwriters enter the Show Me the Music songwriting contest? Since this contest is still fairly new, the number of entries received is far less than some of the other major songwriting contests. With 1000 songs entered last year, Show Me the Music(SMTM) is still offering the same huge prizes one may find when entering contests with 15,000-25,000 plus entries! Just take a look at last year's Grand Prize Winner! SMTM does not run the songs entered through an algorithm machine to find out what a computer says is a great song! This songwriting contest takes great pride in having real people listen to each song entered. Songs are judged on melody, lyrics, song structure, and originality. Entries are not judged on production! With that being said, this year’s Grand Prize Winner will have a difficult decision to make…..$10,000 U.S. cash, or…. $3,000 U.S. cash and a Recording Session in Music City, Nashville, TN. The Winner chooses the prize! The contest will run in three phases. In each phase a winner will be awarded. Enter as soon as possible for an opportunity to win these early awards and prizes. Phase 1 will end March 31st. Phase 1 and 2 winners will receive $250.00 U.S., an award certificate, a Show Me the Music t-shirt, and a featured spot on the SMTM website. They will also automatically advance to the top finalists for a shot at winning the overall grand prize. Phase 3 will award the overall Grand Prize Winner with their choice of Grand Prize Package A or B. What are the 2 choices for the Grand Prize Winner? Some of those who have entered in the past already have an amazing recording of their original song. All they need is some cash to get the tour on the road, buy new equipment, pay off some bills, fund a promotion, or just have a fatter wallet. Prize Package A was designed for these people. Copy Cats Media (http://www.copycatsmedia.com) is also manufacturing and donating 500 packaged cd’s of the winning song! If that is what an artist is looking for, then this contest is a perfect match!. Plus much more! Please visit the prize page for more details. What is there to say? CASH! One thing is for sure, $10,000 U.S. will give the winner a lot of choices! What if the entrant doesn't have a high quality recording of their song or connections in the music business? SMTM will provide that for the winner! If the Grand Prize Winner chooses the Recording Session Prize Package, accommodations will be arranged for 3 nights stay in Nashville, TN, $3000.00 to use towards airfare and spending money, a meet and great with top Producers, A-list Musicians, publishers, songwriters, and song-pluggers for major labels. This package also includes a recording session at The Castle recording studio in Franklin, TN with world renowned producer Rob Feaster. The winning song will be brought to life as the winner records with the same musicians who are on today’s #1 radio hits! Copy Cats Media (http://www.copycatsmedia.com) generously offered to manufacture 500 cd’s of the winning song. For more details please visit our prize page. This year SMTM has lined up some truly amazing sponsors. If the winner chooses Prize Package B, the winning song will be recorded at Castle Recording Studio (http://www.castlerecordingstudios.com). This studio has a rich history! In the early 1900's this castle was used as one of Al Capone’s hideouts as he was bootlegging liquor across the country. Now it is known as one of the world’s most famous studios. In 2009 Brad Paisley (CMA Vocalist of the year), and Darius Rucker (CMA New Artist of the Year), both recorded their albums at the Castle. Other artists, Miley Cyrus, Snoop Dogg, Bob Dylan, Bruce Springsteen, Ziggy Marley, Lynyrd Skynyrd, Meatloaf, and many others have used this studio to record their hits. Show Me the Music looks forward to hearing an all new set of original music and wish everyone the best in the contest! You can’t win if you don’t enter. Now, get those songs ready and Show Me the Music!